If you’ve always struggled with misaligned teeth, or if your smile has simply lost its way since you wore braces in adolescence, your cosmetic dentist in Waco has a solution: ClearCorrect. These clear braces are designed with busy adults like you in mind. Keep reading to learn more about the fantastic orthodontic option! To set you up with your ClearCorrect system, your dentist will closely examine your teeth and bite and put together your unique treatment plan. This information will be sent to the ClearCorrect lab, where your aligners will be created and shipped directly to you. Once you receive your system in the mail, you can begin wearing your first tray immediately! During your ClearCorrect treatment, you’ll advance through the system with a new aligner every two weeks. Stay on top of your six week visits to your dentist to make sure everything is progressing as it should, and you’ll quickly be on your way to your new, straighter smile. The average ClearCorrect treatment lasts just one year — almost half the time of many traditional braces treatments. When you choose clear braces for your orthodontic treatment, you’ll enjoy the wealth of benefits that come from this subtle option — and they’re about more than its invisibility. Some of the most common benefits of this system are related to the fact that ClearCorrect’s aligners are removable. That means there are no limitations to your diet, and you can continue to brush and floss your teeth just like you’re used to. Additionally, ClearCorrect is a largely self-directed system. Just wear the aligners as directed and visit your dentist every six weeks and you’ll be through your treatment before you know it. Compared to traditional braces, you’ve got more freedom to live your life with ClearCorrect. 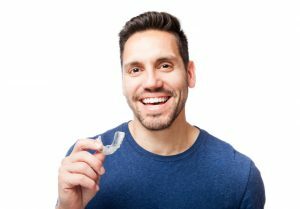 You’ve probably heard of Invisalign, the other leading clear braces system. The two methods are very similar. At Premier Family Dental, we are proud to offer our patients ClearCorrect for a few reasons… one of them being the fact that ClearCorrect is an American company with products that are made in the USA. If you’re ready to enjoy straighter teeth and improved bite alignment, forget about metal brackets and wires. It’s time for you to learn about ClearCorrect! Patients in good dental and oral health who are interested in improving the alignment of their teeth are typically excellent candidates for clear braces in Waco. Contact your dentist in Waco today! by: Dr. Rick Cofer at May 26, 2016 .